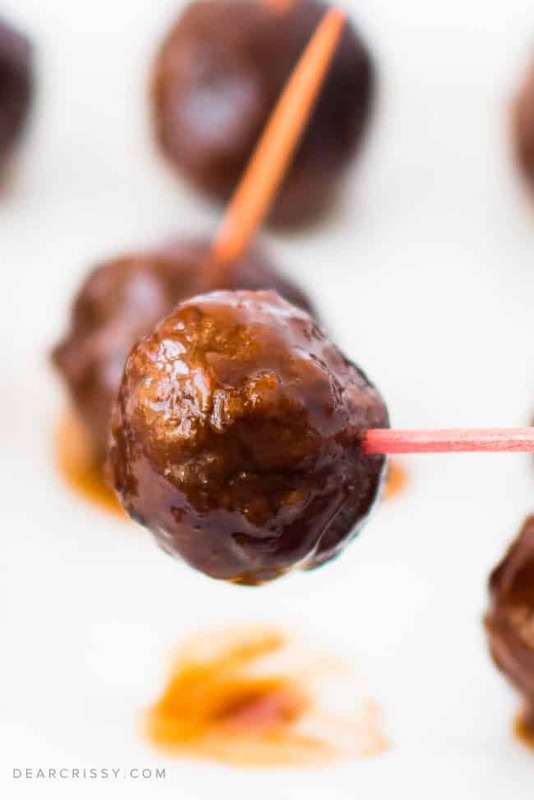 Crock Pot Meatballs Recipe - Grape Jelly BBQ - 3 Ingredients! 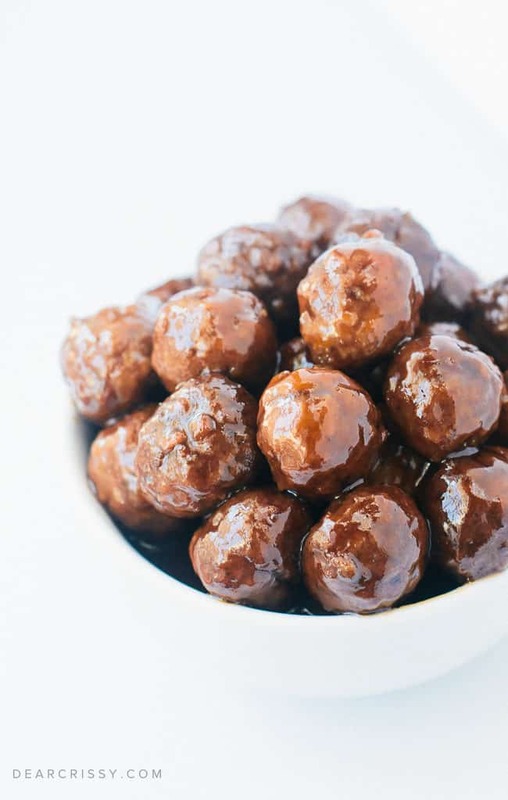 Crock Pot meatballs made with just grape jelly and BBQ sauce? Yes! 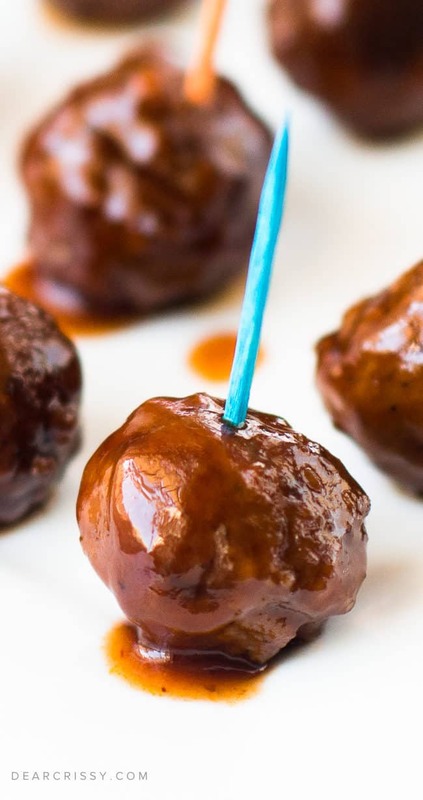 This Crock Pot meatballs recipe is easy peasy and people ALWAYS love this recipe. 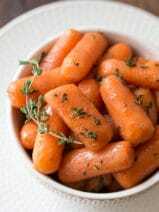 Be a hero this holiday season and TRY THIS RECIPE! 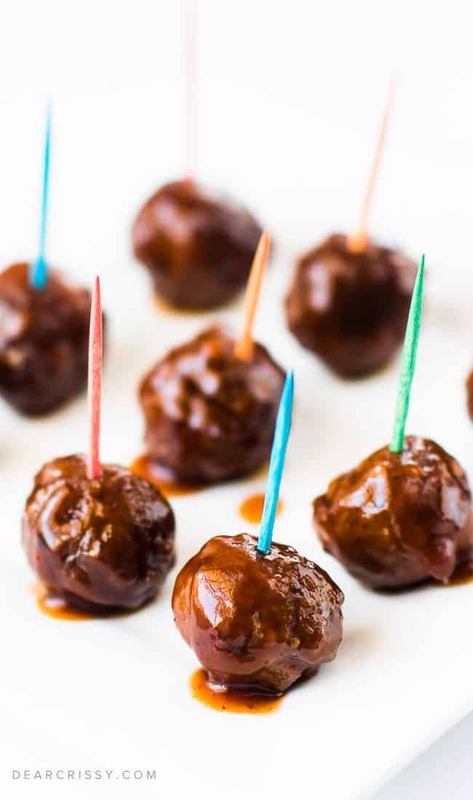 This is my go-to recipe for meatballs. I love it because it’s so simple and takes just seconds to put in the crock pot, set and go. 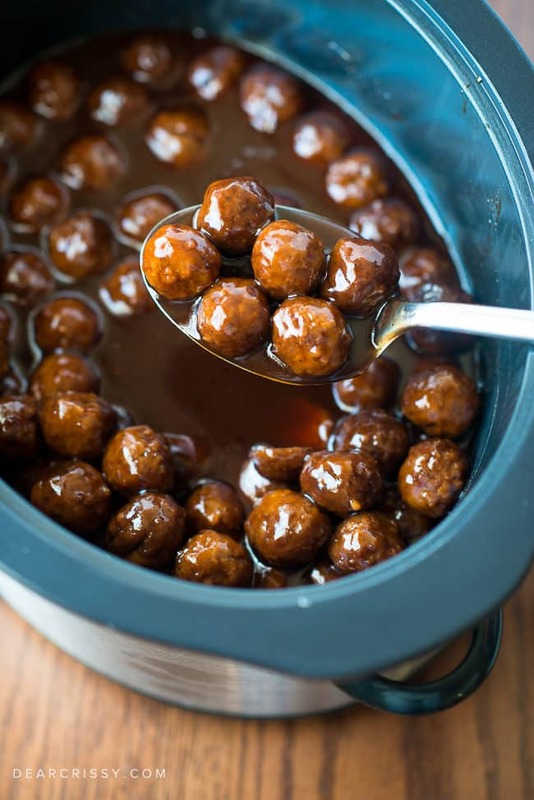 Let’s face it, when it comes to the holidays, game day or any special occasion, everyone loves a warm crock pot full of flavorful meatballs. 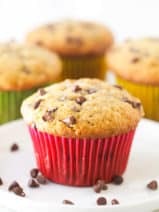 I know my family can’t get enough of this super easy recipe and it’s why I keep making them over and over. 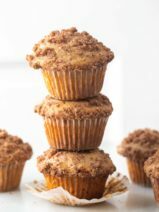 I went a little nuts when I photographed this recipe and probably included too many photos in this post. What can I say, I was hungry during the editing process! I always make this dish for our Christmas Eve festivities, but these easy crock pot meatballs are also great as a simple weeknight dinner. We often serve them over rice with some vegetables on the side. They are so hearty and filling. Even the kids love them and that’s saying a lot. They’re also a great game day appetizer and I always make them along with my amazing sausage stuffed mini sweet peppers on Super Bowl Sunday! Sure, you could make your own meatballs and put together a special sauce from scratch, but why? 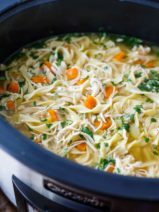 In all seriousness, there are times for complicated dishes and there are times when you just want to throw a few tried-and-true ingredients in your trusty crock pot and know that what comes out is going to be super delicious. 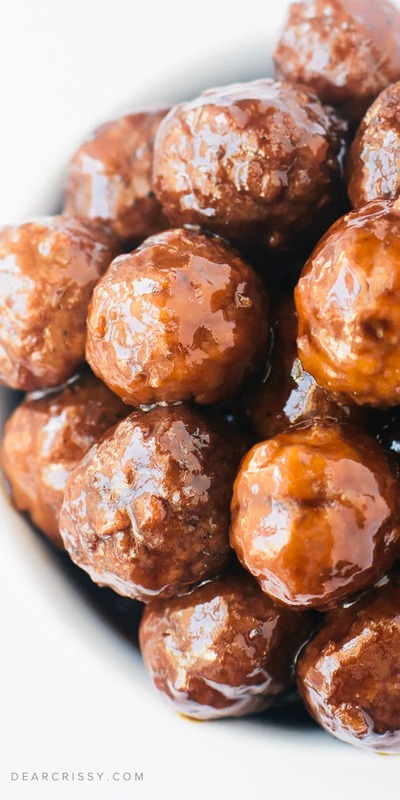 This crockpot meatballs recipe is what you want in those moments! It’s funny, because the first time I tried this recipe I was pretty skeptical. I mean, frozen prepared meatballs, grape jelly and BBQ sauce? Really? Yes, Oh, yes. It is so good! If you end up giving my easy crock pot meatballs recipe a try this holiday season I’d love to hear what you and your family think about them. Please leave a comment below to share your feedback. Do you make your meatballs a different way? I’d love to hear your modification ideas in the comments as well! 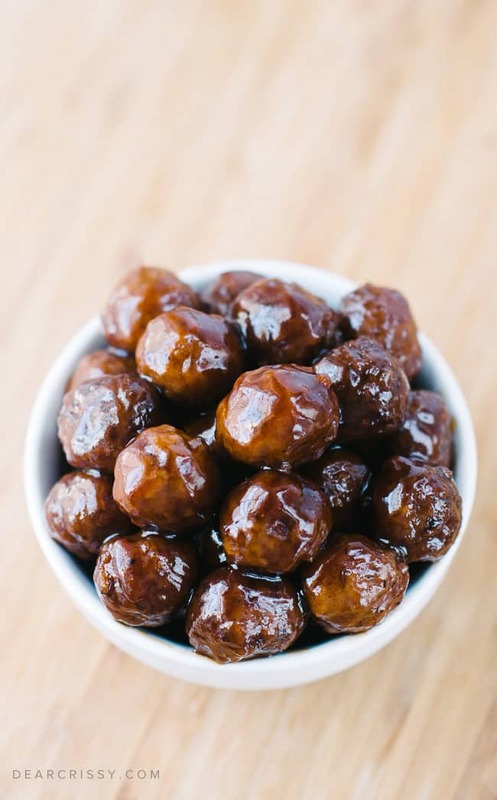 If you’re looking for some more amazing party finger foods, check out one my favorite recipes, these bacon wrapped water chestnuts! 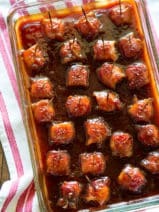 Add grape jelly and barbecue sauce to a slow cooker, stir to blend well. 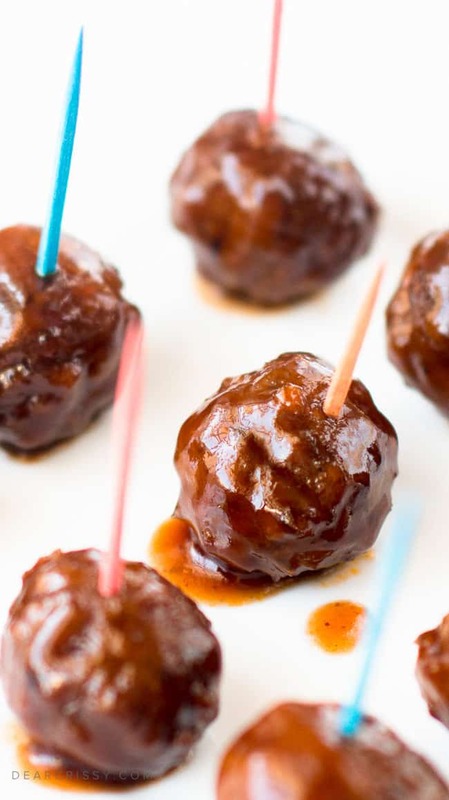 Stir in meatballs to coat. Cover and cook on high for 3 to 3 1/2 hours, stirring halfway during the cook time. I have made this recipe for years. My family and friends love it. It’s so simple and taste great. I do make my own meatballs though but I do that the night before. If you are pressed for time, buy the premade meatballs. I will always use this recipe because it is the best sauce be recipe I’ve eaten. Do you put the meatballs in frozen? 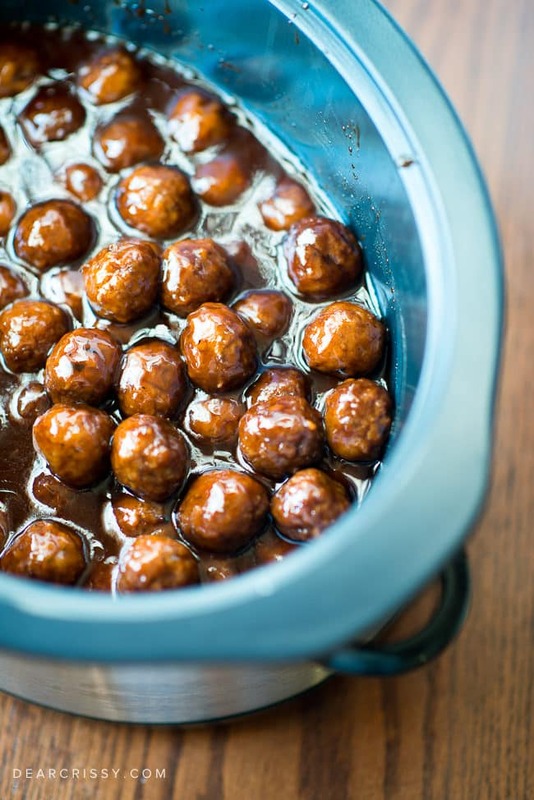 We just made swedish meatballs, could we have made them in a crock pot? I tried your recipe for my meatballs! And I added mini hot dogs and kielbasa and it all just tastes fantastic! Do you thaw the meatballs or put them in frozen? I did and it tasted just the same. Wonderful and delicious either way. I want to double the crockpot meatball recipe. How long should it cook? Thanks! I haven’t tried it, but should be fine! I just made this for church on Sunday. I actually used this barbecue sauce and Kraft sweet honey barbecue and the jelly. The meatballs turned out very good. Their wasn’t any left to take home. I’ve done this recipe a few times, but switched it up a bit. I used the grape jelly and horseradish mustard instead of the Bbq sauce, it’s not too sweet, and the mustard gives it that tang and a kick from the horseradish. It’s more sweet and spicy. I use both BBQ Sauce and spicy mustard. You get the sweet and the pungent. Is there any way you could fit more annoying ads on this page so it’s harder to read? Just checking. I think you might have some room. I had forgotten this tried & true recipe. Thanks for bringing it out again. It’s always a winner, CHRISTMAS EVE or 4TH of JULY. Can’t go wrong with this!!! 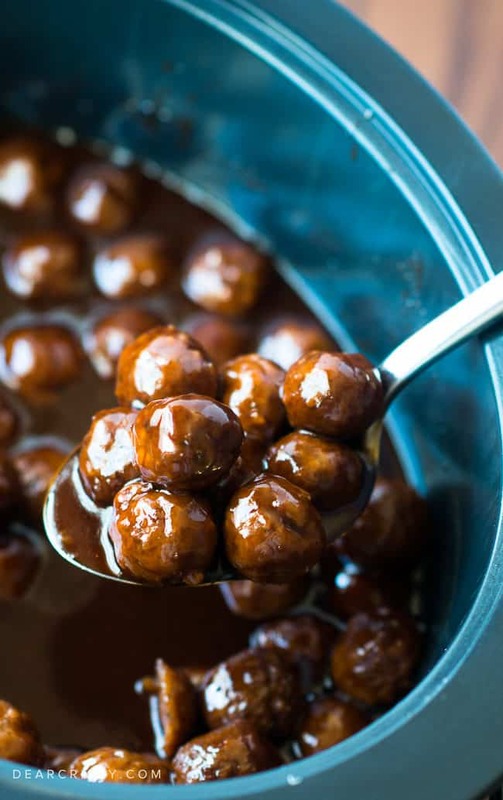 I’ve seen a similar recipe for Lil smokies, do you think it would work to do both meatballs and little smokies in the same crockpot? Can I cook in crock pot on low for 6-7 hours instead of high? I plan on making these for our first annual Friendsgiving. We will be having a lot of people over so can I assume to double the grape jelly/BBQ sauce if I use two bags of meatballs? Do you think I could double this recipe in one crockpot? Would the cooktime be the same? I made this for a family reunion today and everyone loved them! Even the kids were raving about them! Thanks for sharing! Wow i grew up with this recipe only mom use mini hot dogs. We hwd it every christmas! You can never have too many pictures!! Love this recipe. So simple yet its a crowd favorite I hear. I don’t eat meat but the sauce smells good when its cooking in the crock pot for hours. Crissy ! These are so good ! I have also made them. with gravy ! So good. Your photos look so tasty ! If you think it is too sweet, try using Cattleman’s brand sauce in the Carolina Tangy Gold flavor. Adds just enough zing to the sauce. Every time I fix them this way I do not have any leftover. Love these meatballs! My aunt has been making them for years and years. Now I make them with my children and we all love them. Turned out great, but too sweet for me, personally. Thank you for sharing! My sauce is too thin :( what did I do wrong? I followed your recipe. Are you using an old crock pot? Mine was thin as well, may just be the BBQ sauce and jelly combo. Mine also finished sooner than expected so I just put it on keep warm until dinner. 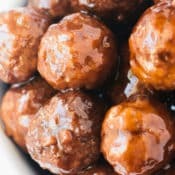 What brand do you suggest for meatballs? Yes way too many of the same photos lol but, their all great pictures. Excited to try this recipe.